Meeting. Just the word can summon up dread for even the most dedicated of employees. But why is that? Well, perhaps it's a sense of wasted time - as a recent survey from Office Broker showed, the average office worker spends around 16 hours a week in a meeting; which, when added up, equates to over 750 hours in just one year. With employees working busy days with restrictive time constraints; they can already feel like there isn't enough time in the day; but with some effective planning, that essential meeting you're organising will feel like time well spent for both you and your employees - here are 7 tips which will help you to do so. > Effectively communicate with employees beforehand Send out invitations to your employees at least 24 hours beforehand, with a brief outline of what will be discussed in the meeting. If the meeting will cover a few different subjects; it's worth allocating time slots to each one, especially as it will help deter you from running over during the actual meeting. > Be Punctual If the meeting is supposed to start at 10am; make sure you start at 10am, even if some of your colleagues have not yet arrived. Employees who have turned up on time will thank you for it, as they won't want to sit around for fifteen minutes when they have work to do; especially as it means the meeting will more than likely run over at the end. 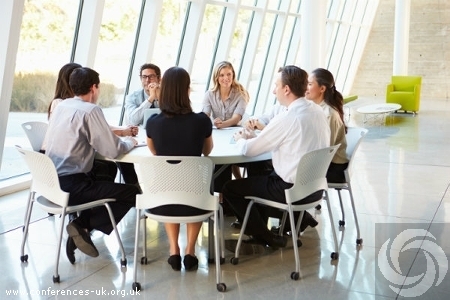 > Define the purpose of the meeting Even though you've already outlined the topics of discussion for the meeting in the invite; there is no harm in cutting to the chase and again, explaining why you have arranged this meeting, the subjects that will be available for discussion, and what you aim to get out of it. Straightaway, that will engage employees, refresh their memories and act as a confirmation that the meeting has a specific point. > Provide refreshments If your meeting is scheduled to run for a considerable amount of time (for instance, more than an hour), it can be a nice touch to provide some refreshments - even if it's just bottled water and some biscuits. It can be a good idea to factor in a quick 10 minute break so employees can relax and digest the information, before continuing with the discussion. > Don't veer off topic With ideas and opinions flying around, it can be quite easy to get distracted and discuss something completely off topic. If this happens, stop the conversation before it becomes a fully-blown debate - after all, neither you nor your colleagues want to run over time. > Assign clear action plans From your findings from the discussion, clearly announce the action plans that you and your colleagues must take to achieving your specific goal(s); delegating these plans as effectively as possible. Ensure that all colleagues are 100% clear on the action to be taken; and are happy with the task(s) they have been allocated. > Conclude with plans for the next meeting Once everyone is clear on their responsibilities, and the time frames in which to complete them; briefly close the meeting with a suggested date for the follow up meeting; allowing colleagues to effectively prepare. Let's face it: everyone has been to an incredibly dull meeting at some point in their working life; but everyone will no doubt have been to an inspiring one too. Make sure yours falls into the latter - after all, there is no point in a meeting that has no point.